VirtualyGEST .NET is an innovative application ERP business management of last generation, whose main purpose is to manage effectively, seamlessly and in real time, all information generated different areas of a enterprise (SME): Sales, Purchasing, Warehouse, Manufacturing, Accounting, etc. The objective of this powerful tool is to facilitate the maximum daily work to improve all processes commercial, financial and production of an SME. Ultimately provide a comprehensive solution to the enterprise to be more competitive. This is an application ERP flexible, modular and fully customizable to the needs of each enterprise so you do not need a large investment to use this powerful tool in your enterprise. No matter the size of SMEs. Can be used in companies with a single computer and in companies with dozens of computers connected to a server. You can start using only basic modules and then to grow as needed, without any limitation. The customer chooses the modules that are needed for each job, according to the functions carried out by each and the type of enterprise involved (commercial, industrial or services), paying only for what you actually use and optimizing the total cost of your investment. 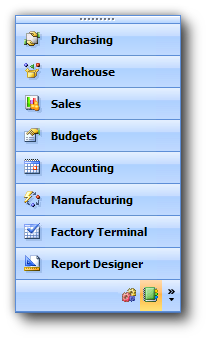 A commercial enterprise or service does not require the production module, for example. In contrast, for an industrial enterprise Production module is essential if you want to control the manufacturing and inventory costs. However it can be implemented from scratch or buy it later, as needed. You can configure users viewing the same application in different languages and also have access to only certain areas of the application, to safeguard important information Enterprise. Backup system remotely, through which users can worry full of daily backups, as all critical information is always safe application and outside the enterprise automatically and completely safe, every 30 minutes or the time specified in the configuration. Also all data changes are recorded to see then at any time, who, when and why each change was made in the data. PURCHASING: Allows you to manage the procurement of goods, goods, supplies and services to control the stock of each product, the prices that apply to us suppliers, outstanding orders receipts, invoices, purchase statistics and managing vendor payments, with automatic posting of invoices and payments. WAREHOUSE: Since this module, all products are created (materials, intermediate components, articles, groups, services, etc. ), His compositions are introduced if necessary and consult the updated costs breakdown. You also get stock inventories and detailed information on their movements quickly and clearly. Also, from here you can manage trucks loads or delivery to transport companies, with specific routes customizable by the user, for the delivery of sales orders. SALES: Allows you to manage the sales of smuggled goods by the enterprise, with a thorough control of prices, track the status of production orders, backlog, good serving, change control and collect outstanding merchandise, billing, receipts, remittances, commissions to salespeople, sales statistics, receivables management clients (with effects return control) and automatic posting of invoices, bills, receipts and remittances. BUDGET: Allows creation and maintenance budgets, which can then be passed to order automatically. POS: Point of sale manages the selling process by a salesperson accessible interface, the system allows the creation and printing of the receipt. ACCOUNTING: Financial module adapted to international standards IAS (International Accounting Standards), which covers the accounting needs of any business. Fully integrated with other application modules, to avoid errors or duplication of information. and stocks, and offers the possibility of using bar codes to control more automated manufacturing. FACTORY TERMINAL: A special module with reduced functionality, suitable for installation on computers placed in the factory, to automate the manufacture using bar codes, rfid, etc. REPORT DESIGNER: Allows creation and adaptation of all reports, lists, documents and labels for the remaining modules at any time and as needed. The whole management system also includes an integrated basis in the main modules, tools CRM to manage issues with customers or suppliers, as well as any movement of purchases or sales made (issues with orders, with the goods delivered , etc.) communications with customers or suppliers, ability to write general information about them that is deemed useful for the enterprise, etc. ERP VirtualyGEST .NET always use the latest technologies available for customers to ensure their investment in the medium and long term with an application constantly updated. Depart from your current computer setup, without worrying that the power is reduced for future expansion equipment and jobs, at any time adapting to their growing needs. Manage several companies if necessary, and also within each enterprise can work with various branches. Working remotely from outside the office and access all information anywhere safely. Safety your data, since all the information is always kept encrypted with different random keys and different for each enterprise, so that no unauthorized person can access enterprise data. ERP VirtualyGEST .NET is updated automatically and permanently on the Internet with the latest improvements and developments, taking suggestions from all users, to adapt fully to their present and future. Any question or issue is resolved quickly by Online Technical Support and Remote Control, through Internet, a technical team constantly available to answer any questions, no waiting. 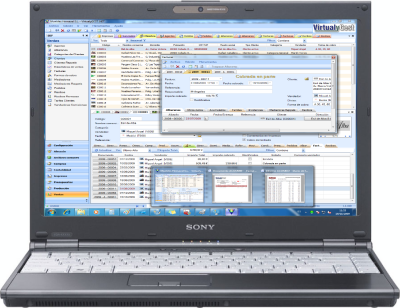 An information system ERP VirtualyGEST .NET is a business management application that integrates the entire flow of business information, thus improving processes in different areas. Access to reliable, accurate and timely as needed. Sharing information between all components of the enterprise. Eliminate redundant data and unnecessary operations. Reduce time and costs of litigation. 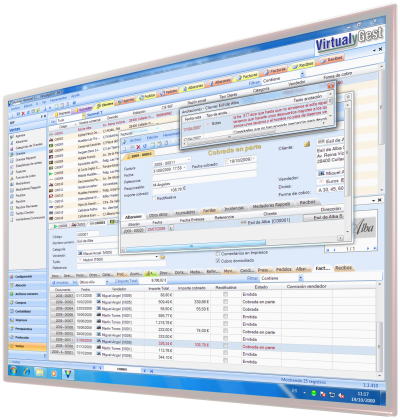 The correct implementation of the ERP VirtualyGEST .NET brings significant productivity increases and the possibility of having better and more updated information in making decisions. The information of a enterprise is its most important and valuable, if for any reason that information is lost, the difficulty to continue the business would be large... Be assured business continuity in case of any contingency is vital. 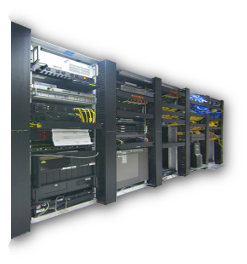 However, usually not given much importance to the performance of backups and much less to copies stored offsite, as it is a tedious operation to be done manually and often interrupted the work of operators. For this reason, ends up not performing with the continuity that should, and to any incident we can find, at best, outdated copies that would require re-key all data from weeks or even months ago. With this service, remote copy online, you can avoid the problem, since his enterprise doubles every 30 minutes or the time specified in the configuration and fully automatically, via the Internet, all information encrypted application ERP VirtualyGEST .NET in the VirtualySoft data center, thereby eliminating the risk of losing your information to any incident, damage or loss. Your data is safe from any incident and off-site, which protects you against natural disasters, fire, virus, human error, hardware or software failures, etc, ensuring the security of your critical data in a convenient and economical. Confidentiality is also guaranteed; since they use the best encryption systems that no-one can access your information. 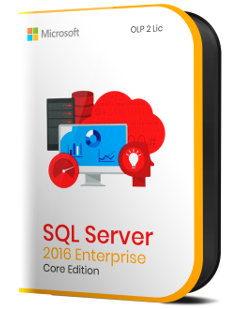 The information is encrypted with strong encryption (AES 256) before it is sent fully encrypted and travels to the remote server backup, which is also stored encrypted with the highest levels of safety, thereby complying with the Data Protection Act guidelines and APD. Additionally, you can conveniently store any private file you want, with the same level of security and encryption (AES 256) that is used for backups. On the other hand, it can put files with catalogs, price lists, photos, etc, accessible at any time after using a download page with your password, or by sending a simple link to the recipient via email rather than attaching such large files and fill your mailbox.